Copied and pasted from the 2018 Halloween contest. You can follow my video walkthroughs here. 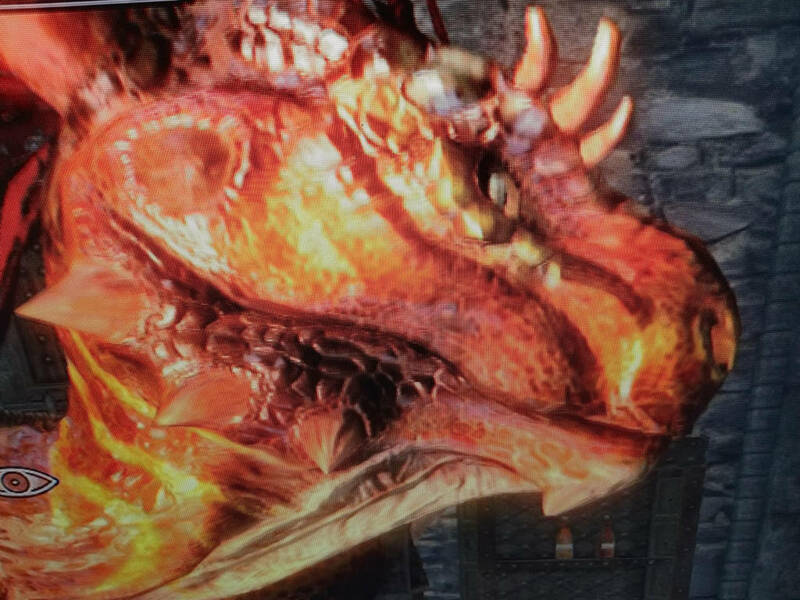 Ryu the Argonian is my avatar from the Elder Scrolls V: Skyrim. I wanted something that said "Skyrim Argonian" yet "original character." Approximately 800 hours of work and $500 worth of materials went into creating this character. He was started in August 2017 and finished in July 2018. 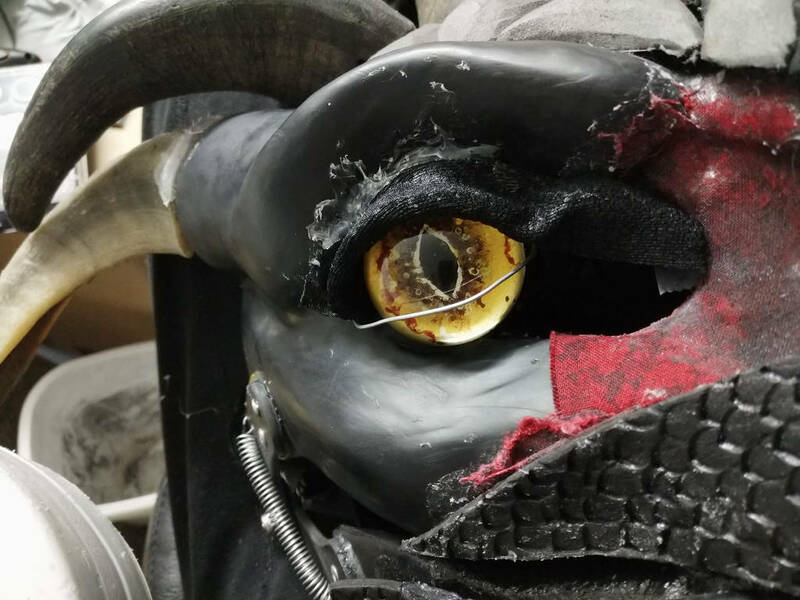 The outfit features an articulated jaw, blinking eyes, approximately 7" stilts, articulated tail, lizard hands, "follow-me" eyes, and a variety of natural props (animal skulls, feet, horns, and herbs/spices). This was my first time attempting anything this large, and despite the outfit being a bit toasty and uncomfortable, I am very happy with the outcome. Accomplishing this creature creation makes me eager to produce more extravagant characters in the future. I am new to cosplay, having only started with my first "real" outfit in July 2017. I was able to make articulating wings for Lucifer from "The Devil is a Part-Timer," and after seeing that I could accomplish a large prop in a month, I wanted to see what I could do in a year. 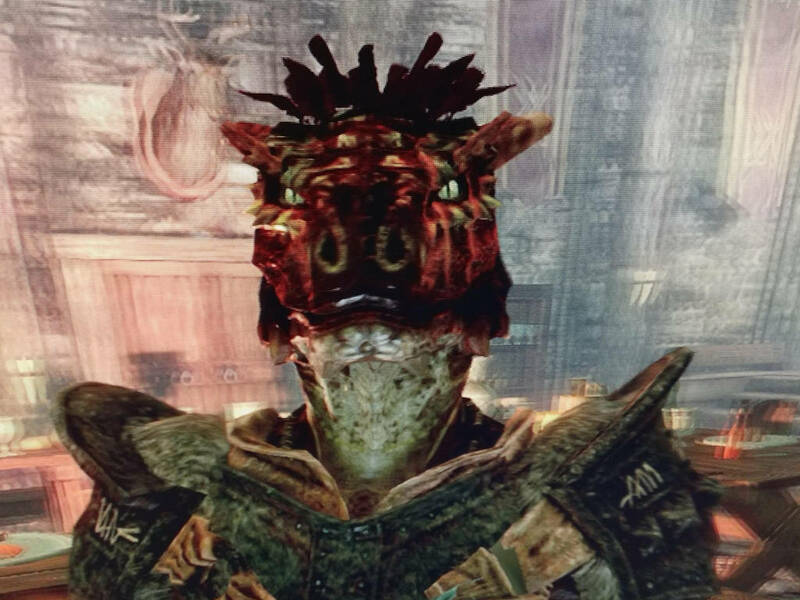 It was then that Ryu the Argonian was created. A variety of materials were used for this cosplay. The base of the head is from DreamVisonCreations. 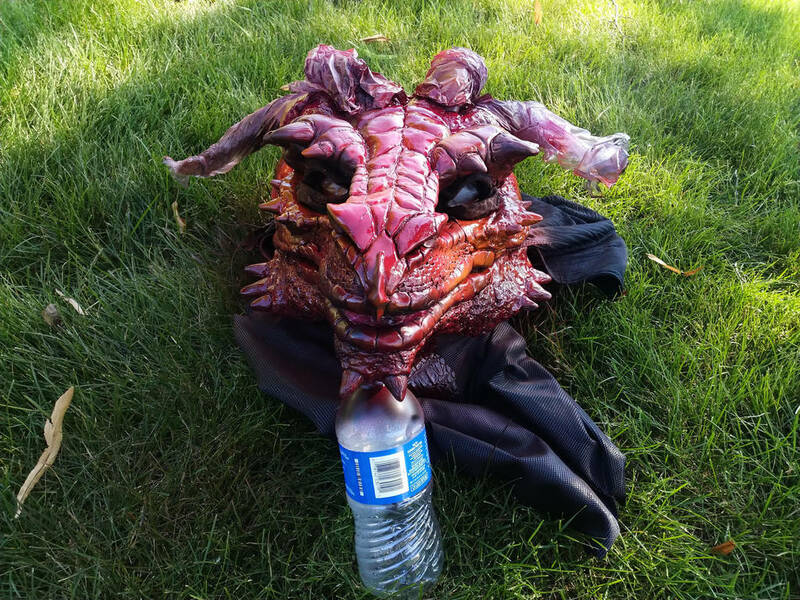 EVA foam, craft foam, and Crayola Model Magic were all used to sculpt the head. The jawset and tongue are also from DVC, but both are hand-painted/airbrushed with acrylic. Both the head base and jawset are resin. The tongue is silicone with added silicone that I sculpted onto it. 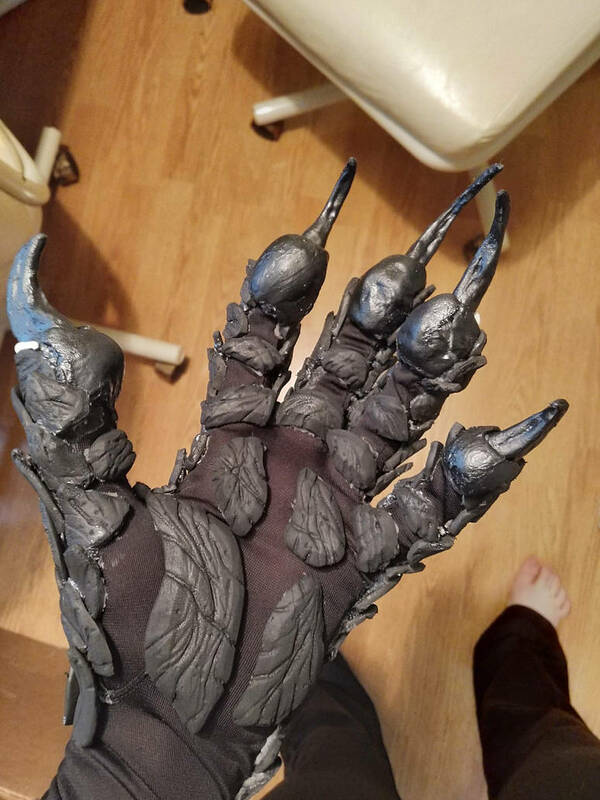 The hands are EVA foam and craft foam on a spandex base sewn by myself. Each scale was individually cut out, shaped, sanded with a dremel, then detailed with a wood-burning iron. The claws on both the hands and feet are made out of Wonderflex. The mesh backing was removed from the rest of the material, heated with a heat gun, then shaped like clay. The tail base was created by Art by Neffertity. 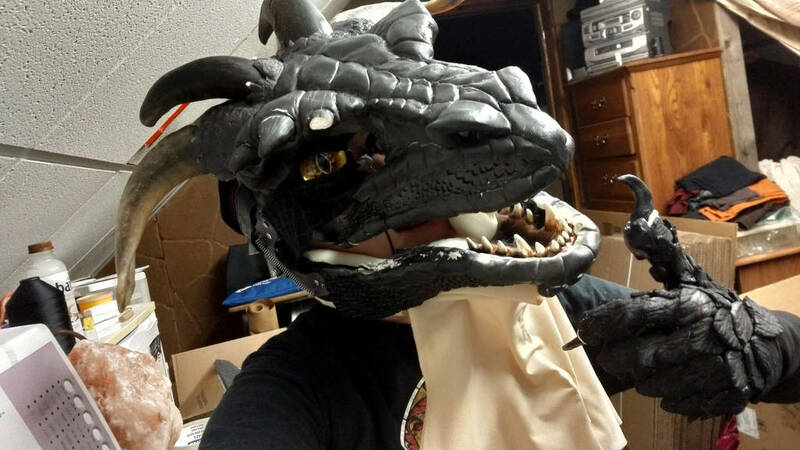 I tried to create my own articulating tail, but after much trial and error, I could not figure out how to work my hand riveter and I was running low on time to accomplish this cosplay. I added all the scales/spikes using hot glue. 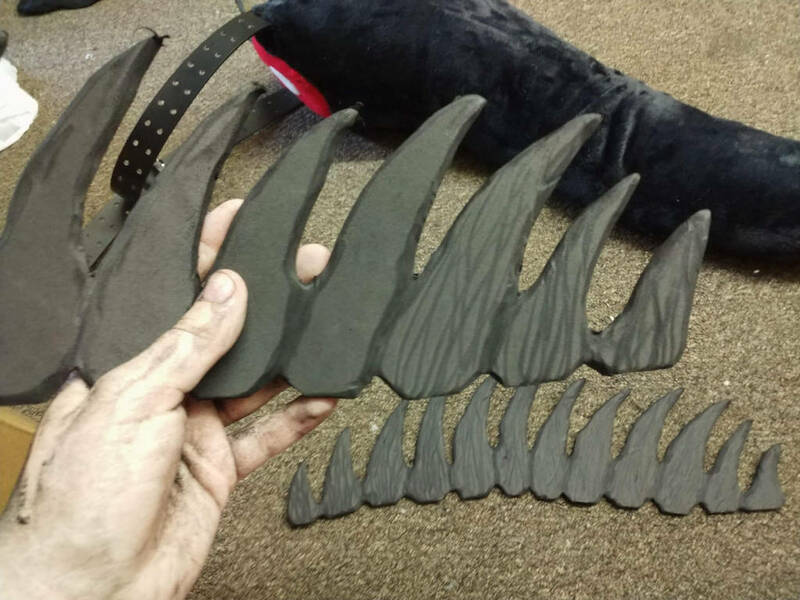 The spikes are made out of craft foam and shaped/detailed with a sandpaper-bit dremel. 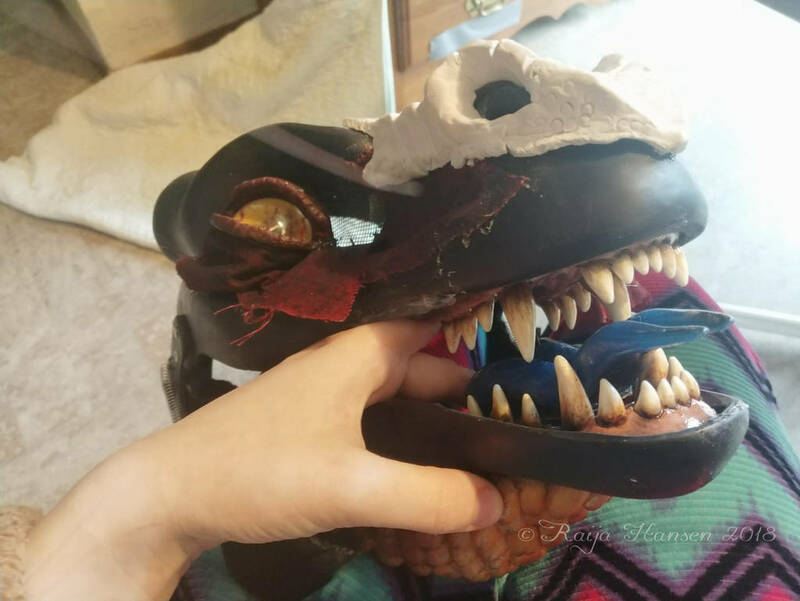 The rest of the scales are puffy shirt paint, hot glue, and textured pleather. The outfit was also designed by me, altered significantly from a McCalls Star Wars tunic pattern. It consists of pleather and cotton lined with binding. The messenger bag was completely designed by scratch, also crafted from pleather. A laptop bag was used as inspiration for this. I have my mom to thank for helping me with this piece of the outfit as she guided me through the process of creating a pattern. The feet are designed as stilts. 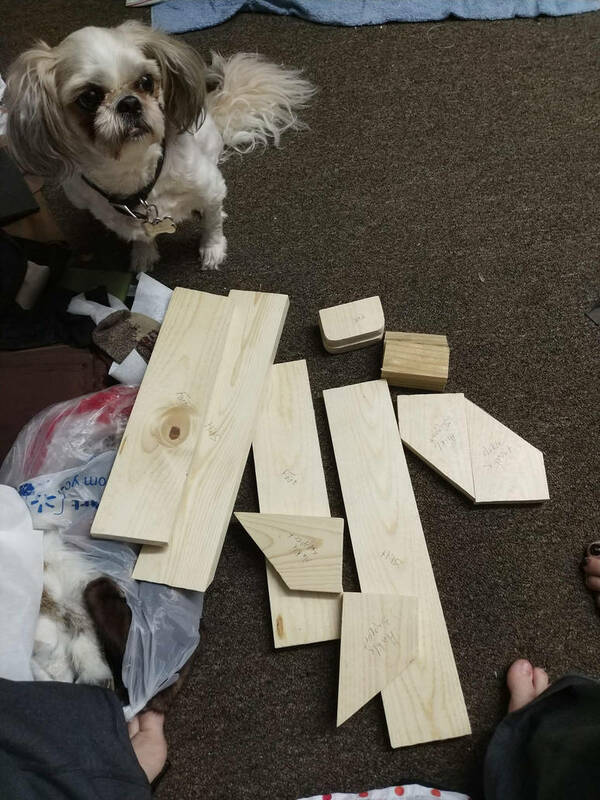 They were cut out of pine wood and shaped accordingly to a pattern by Gryphern. Old tennis shoes were screwed to the wood so I may wear the stilts like enormous shoes. Metal supports were attached to the sides of each shoe, joined by a half-cut PVC tube at the top, with added bungee cords on the back to act as tendons. This kept the stilt at my shin and allowed me better ease of movement. They were then covered with microfleece using hot glue. 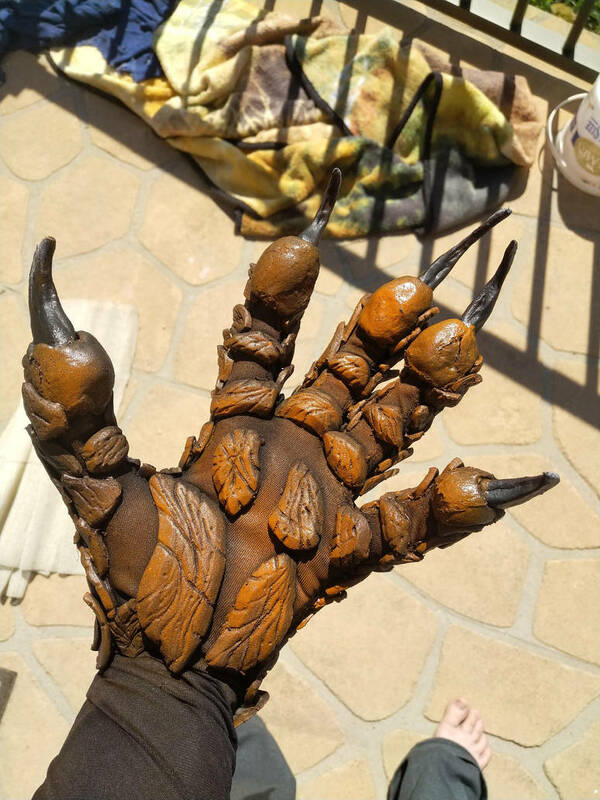 The claws were crafted the same way as the ones on the hands. Everything (head, hands, feet, and tail) was primed with Plastidip, base painted with spray paint, then either hand painted or airbrushed with acrylic. I have a good friend of mine who taught me how to use my airbrush properly, so I have her to thank for teaching me her knowledge. The staff consists of a bamboo, leather, rabbit fur, deer antlers, colored sea glass, and moss. There are also a variety of bones about the outfit, all of which were either harvested by myself or given to me. 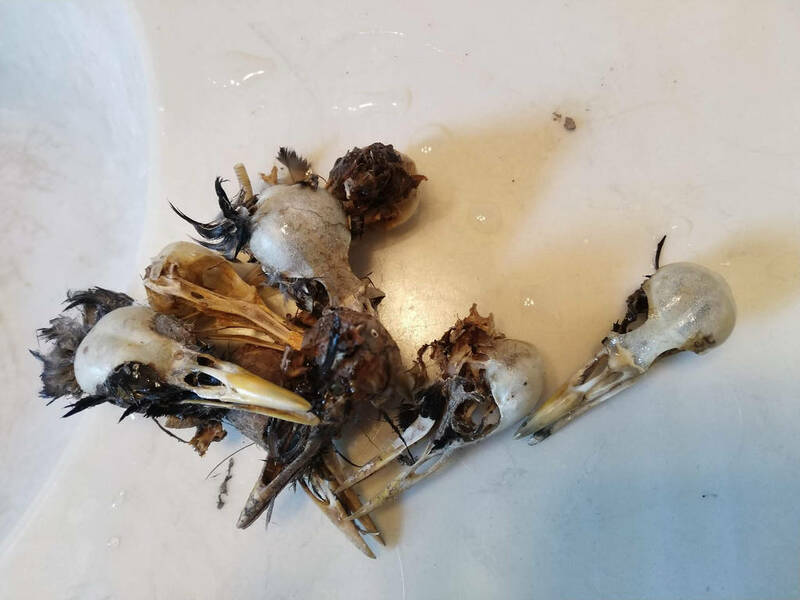 The bird skulls in particular were identified as common starlings (Sturnus vulgaris), all of which were harvested and cleaned by myself. They were found in my garage while we were moving homes during this project. The bird feet were harvested from my brother's Thanksgiving turkey. I wanted a pair of them to have the toes sprawled out, so I set them accordingly and taped them to a wall until they fully dried. 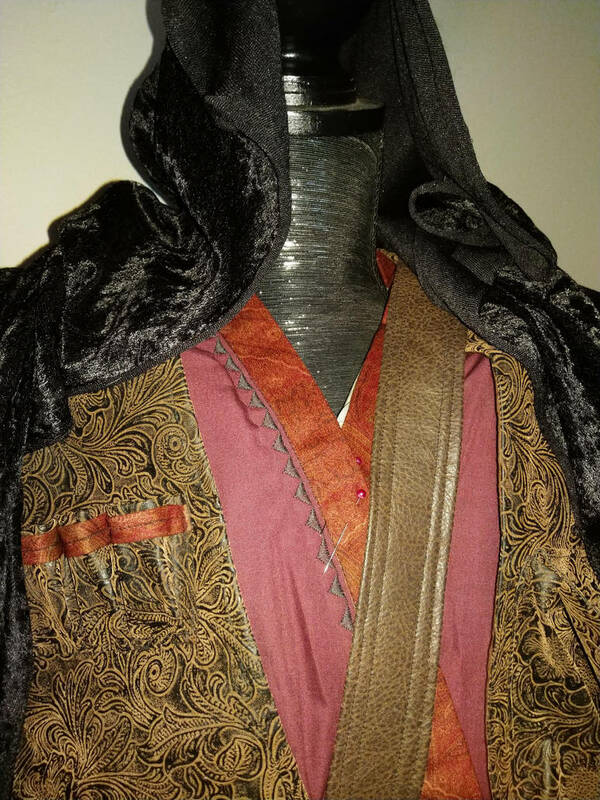 My character is a scavenger, alchemist, and sorcerer, and so I wanted his outfit to reflect that, hence why I went with all natural materials. The horns and feathers atop his head are all natural as well. The horns came from a pet store as dog treats; the feathers are from a craft store. Blinking eyes were one of the most difficult parts of this outfit. Yes, I was able to make it work manually, but the mechanics that made the eyes move needed to be sacrificed if I wanted the head to be comfortable. Silts were another challenge for me. Those, too, are very uncomfortable and I ran into more problems than not with those. They were heavy and difficult to walk in and definitely needed practice. 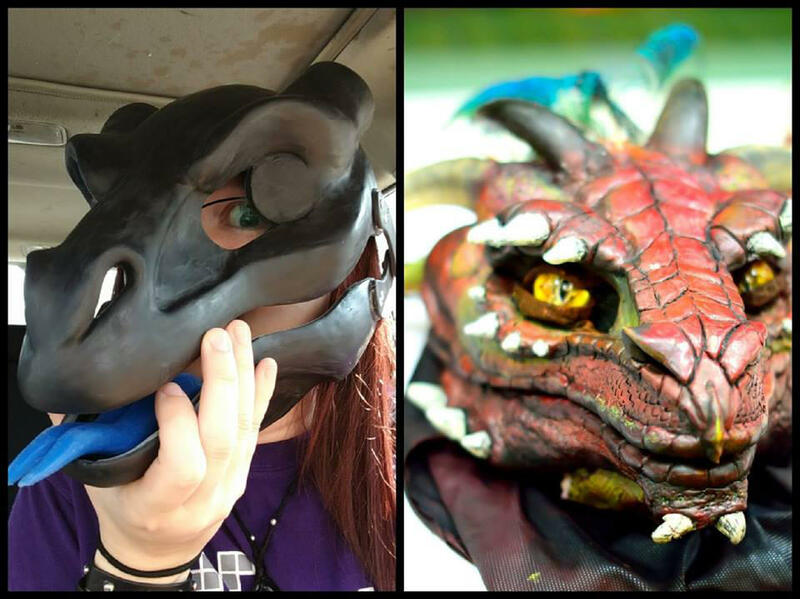 I aspire to learn animatronics and better fabrication so that I may create more life-like and believable creatures. Overall, to sum up my character, I wanted something that said "Skyrim Argonian" yet "original character." I did not like how Skyrim Argonians were a lizard skin on a human model, so I tried to incorporate my own design into the character. 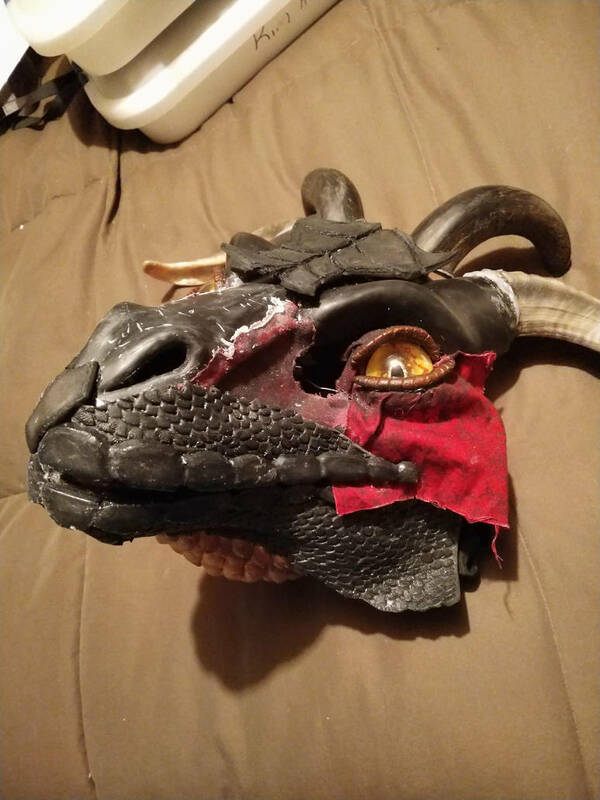 If you would like to see more progress photos and learn more about Ryu the Argonian, you can find me as GameDweeber on Facebook, deviantART, and YouTube, or gamedweeber_cosplay on Instagram. I first used colored pencils to create the eyes. A friend mentioned that they could look much better, so the old design was scrapped, and an iguana eye was heavily used as a reference. 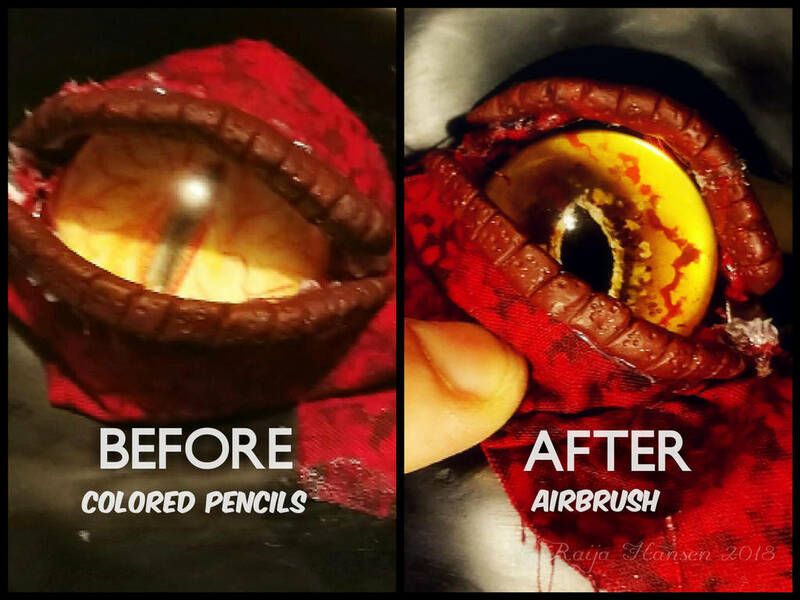 After my friend showed me some airbrushing techniques, we created an eye that looked far better than the last design. 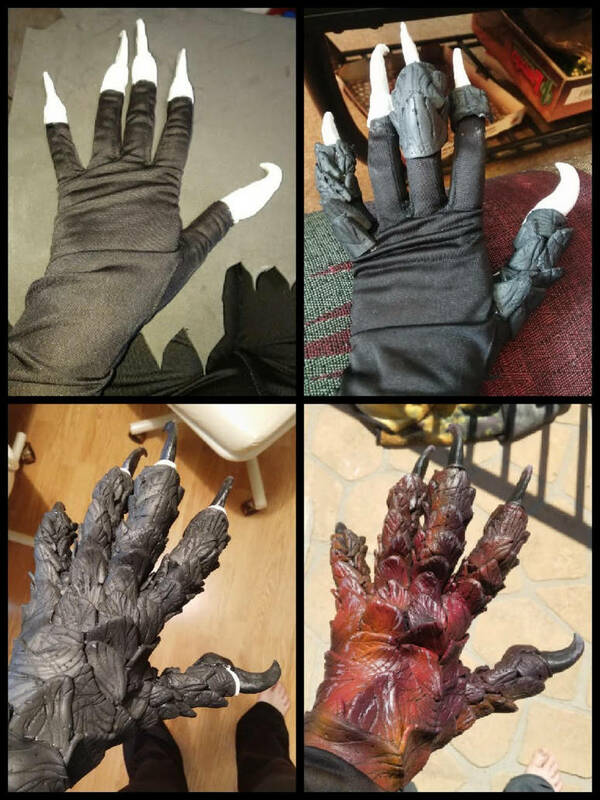 Ryu's hands consist of a spandex base with scales crafted from craft foam. The claws are Wonderflex. I added Crayola Model Magic on the tips of the fingers. It was then primed with Plastidip, base painted with spray paint, and details added by hand with acrylics. The tail base was purchased after I was unsuccessful in creating a tail skeleton of my own. You can see the original tail base on the floor in the second photo. 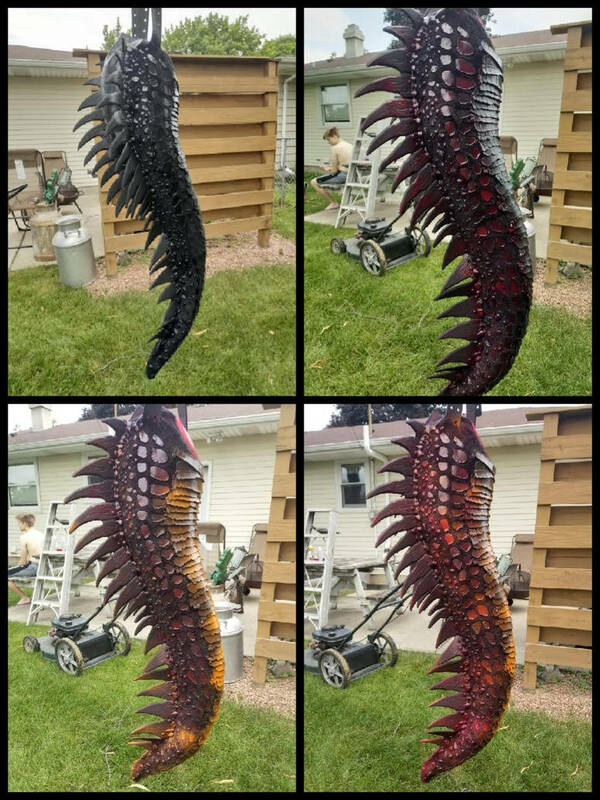 I crafted the spines out of craft foam and detailed them with a dremel, then hot glued them to the tail base. 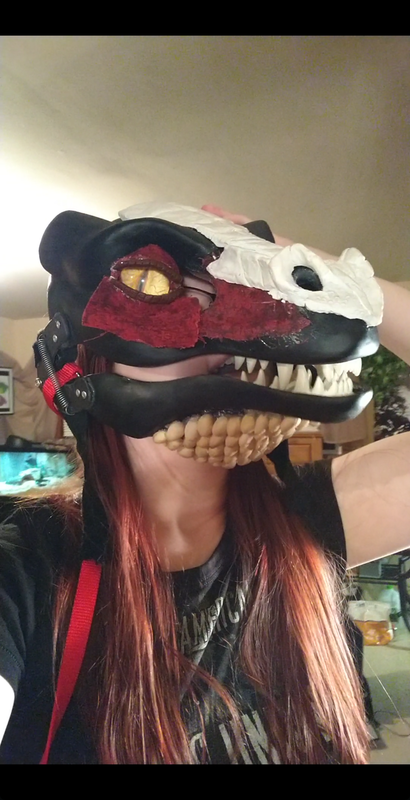 Scales were then added accordingly with puffy shirt paint, hot glue, and textured pleather. 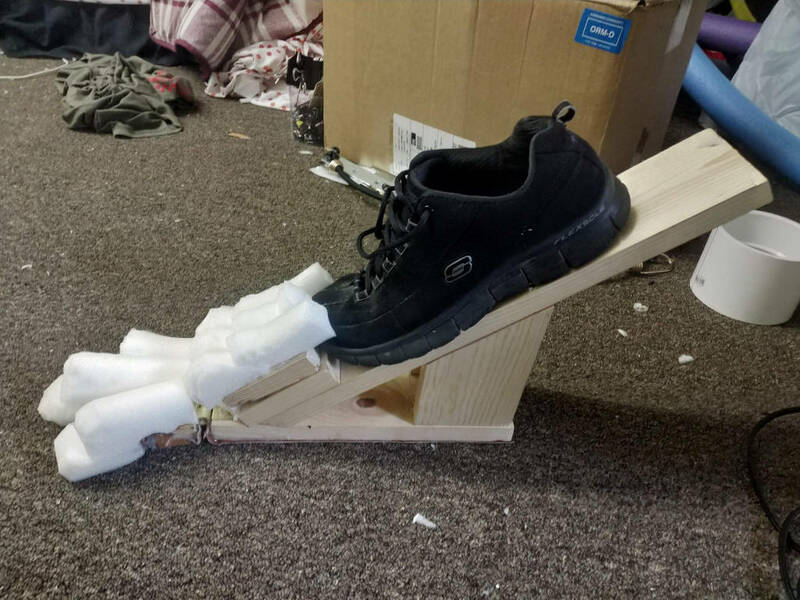 This is an early stage of the stilts designed to be Ryu's feet. Metal supports and a PVC brace were eventually added on the sides of the shoe along with bungees attached to the hock of the leg. This allowed for better movement within the stilts and ultimately kept me from falling over. More upholstery foam was eventually added, cut, and shaped. Claws were hot glued to the toes, then microfleece was wrapped around the entire stilt to cover it. The base of the tongue was ordered from DVC. 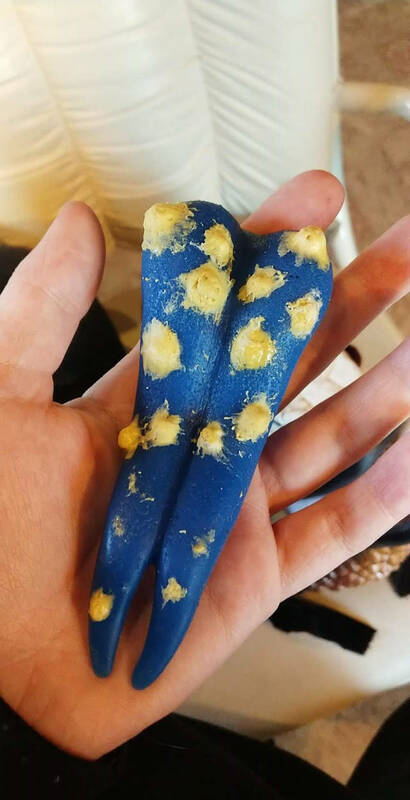 I used a two-part silicone mix to make "warts" on the tongue. At first, I used acrylics on the tongue; this paint easily flaked off. A friend informed me that you must use silicone paint on silicone in order to make the color stick. During the move, I found a number of dead birds in our garage. After identifying that these are common starlings, I was informed that they are legal to keep because they are an invasive species. The skulls were thoroughly cleaned by me, then strung on a rope necklace using a needle and thread. Ryu's outfit consists of cotton and pleather. The design was modified significantly from a McCalls Star Wars tunic pattern. Various vial-pouches and pockets were added so I could keep Ryu's various elixirs and alchemic crafting materials near at all times. I love seeing all the steps it took to make this awesome cosplay. Great work!